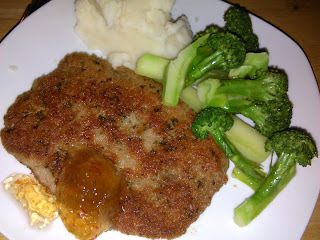 Breaded pork cutlet from Mitchell's, good enough flavour and so easy to cook, just fry it. I boiled a couple of potatoes and steamed some broccoli. The broccoli was cooled and reheated in olive oil. the potatoes were finished with butter, salt, milk. The condiment is Jalapeno Pepper Jelly made by my neighbour Jillian Amatt and I sprinkled fresh lemon juice over the broccoli on the plate. It looks simple but it tastes great and took almost no effort.